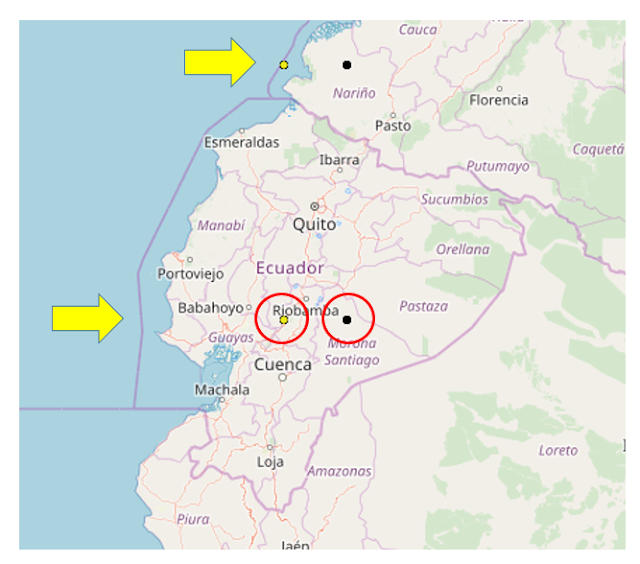 Running our software ahead a little we examine here Ecuador and see some increased activity where we show you the encircled dots. The different colours are different dates. Our method has not produced anything for 5th December. For 6th December the prediction is on the yelloedots and the black dots are on 7th December. The two nearby inside Ecuador are at [2S, 79W] for 6th December and [2S, 78W] for 7th December. The other two are just north of Ecuador as shown. Lets hope the stress is small and nothing happens.